Participate in the SQL Server Twitter Challenge! We have looked high and low for anything with the SQL Server logo and have managed to pull together some stuff to give away to our Twitter followers! We will ask 12 questions about SQL Server on our official Twitter channel at approximately 10:00AM PDT (-8:00 GMT) on each Tuesday and Friday between April 7th, 2011 through June 7th, 2011. The first person to reply to our question with the correct answer (e.g. 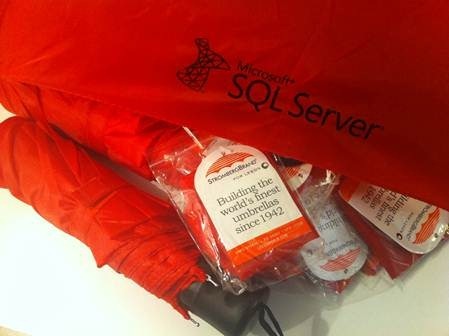 correctly name a feature of SQL Server, etc…) will win the prize of the day. Typos and misspelled words will automatically disqualify you, so be sure to type your answers correctly. You need to be following @SQLServer in order to win a prize, so be sure to follow us today if you haven’t done so already! 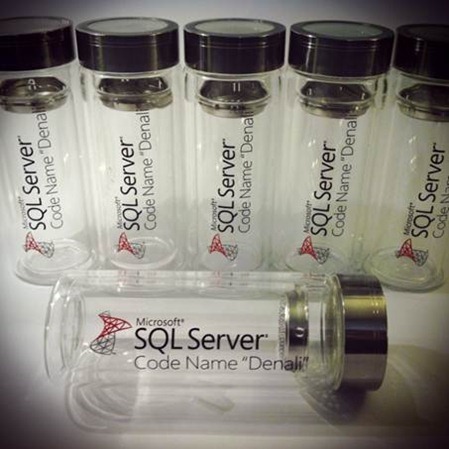 Also, your response to our question needs to contain the #sqlserver hashtag in order to win. Any correct answers without the hashtag will be disqualified. We will post the winners each day as they are determined along with the prize(s) they have won. These are the official rules that govern how the SQL Server Twitter Challenge (“Challenge”) promotion will operate. This promotion will be simply referred to as the “Challenge” throughout the rest of these rules. In these rules, “we,” “our,” and “us” refer to Microsoft Corporation, the sponsor of the Challenge. “You” refers to an eligible Challenge entrant. This Challenge starts at 12:01 a.m PDT on April 7, 2011 and ends at 11:59 p.m. ET on June 7, 2011(“Entry Period”). o You are NOT an immediate family (parent, sibling, spouse, child) or household member of a Microsoft employee, an employee of a Microsoft subsidiary, or a person involved in any part of the administration and execution of this Challenge. This Challenge is void wherever prohibited by law. Once logged into your Twitter account, follow the links and instructions to become a follower of SQL Server at @SQLServer. From your own account, reply to @SQLServer and include in the tweet your answer to the posted question. Your tweet must contain #sqlserver to be eligible for entry. You answer must list the product/feature name correctly including correct spelling. The SQL Server team reserves the right to decide winners as needed based on the situation. The first person to correctly tweet a correct reply will win the prize described below. Limit of one entry per trivia question per person or Twitter account. 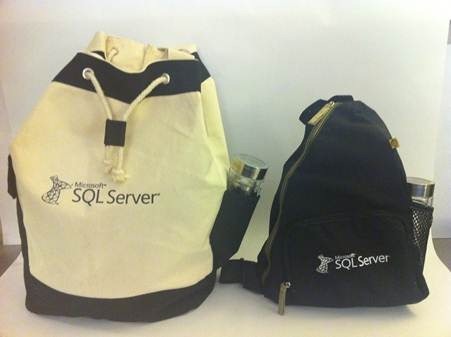 The first person to correcty respond will receve an SQL Server branded tote bag containing branded office items. Approximate Retail Value $30. Limit of one prize per person during the Entry Period. If you are a potential winner, we will notify you via Direct Message on Twitter to the account provided at time of entry within seven (7) days following the random drawing. If the notification that we send is returned as undeliverable, or you are otherwise unreachable for any reason, we may award the prize to an alternate, randomly selected winner. Winners can expect to receive their prize within two (2) to three (3) weeks following verification of eligibility. If there is a dispute as to who is the potential winner, we will consider the potential winner to be the authorized account holder of the e-mail address used to enter the Challenge. If you are a potential winner, we may require you to sign an Affidavit of Eligibility, Liability/Publicity Release within 10 days of notification. If you are a potential winner and you are 18 or older, but are considered a minor in your place of legal residence, we may require your parent or legal guardian to sign all required forms on your behalf. If you do not complete the required forms as instructed and/or return the required forms within the time period listed on the winner notification message, we may disqualify you and select an alternate, randomly selected winner. Your odds of winning this Challenge depend on the number of eligible entries we receive. o That by accepting a prize, Microsoft may use of your proper name and state of residence online and in print, or in any other media, in connection with this Challenge, without payment or compensation to you, except where prohibited by law. If cheating, a virus, bug, catastrophic event, or any other unforeseen or unexpected event that cannot be reasonably anticipated or controlled, (also referred to as force majeure) affects the fairness and / or integrity of this Challenge, we reserve the right to cancel, change or suspend this Challenge. This right is reserved whether the event is due to human or technical error. If a solution cannot be found to restore the integrity of the Challenge, we reserve the right to select winners from among all eligible entries received before we had to cancel, change or suspend the Challenge. If you attempt to compromise the integrity or the legitimate operation of this Challenge by hacking or by cheating or committing fraud in ANY way, we may seek damages from you to the fullest extent permitted by law. Further, we may ban you from participating in any of our future Challenge, so please play fairly. We will post the winners on @SQLServer each day as they are determined.